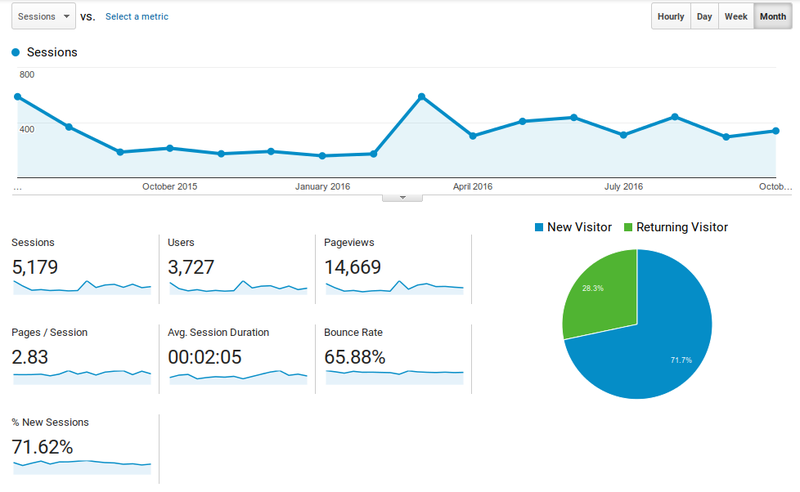 I use Google Analytics to track traffic to this site. In the interest of transparency, I release some summary data here. Around the end of June 2015 (I think) I realized that Google Analytics wasn’t doing a good job of filtering out fake referral spam, which was artificially driving up pageviews. To counter this, I implemented some filters to exclude certain referrals. However, Google Analytics can only show graphs for filtered views since the time when the filter was created. Thus the graph below includes the months July 1, 2015 through October 31, 2016, with monthly granularity. As of late 2018, you can see pageview counts for this website at monthly granularity on Vipul Naik’s analytics portal. This website is listed as “Issa Rice”. The data is via Google Analytics and excludes identified spam traffic.